The Air Jordan 11 Low Columbia Blue will be making a retro return as part of Jordan Brand’s Summer 2017 lineup. Last released back in 2001. The Air Jordan 11 Low features a clean White leather upper with Columbia Blue patent leather around the base of the upper. Completing the shoe is a White midsole and translucent outsole. Look for the Air Jordan 11 Low “Columbia Blue” to release on April 15th, 2017 at select Jordan Brand retailers. The retail price tag is set at $175 USD. UPDATE: First released in the early 2000s, Jordan Brand brings back the classic “Columba Blue” Air Jordan 11 Low that’s now done in University Blue. A release date is set for April 15th. 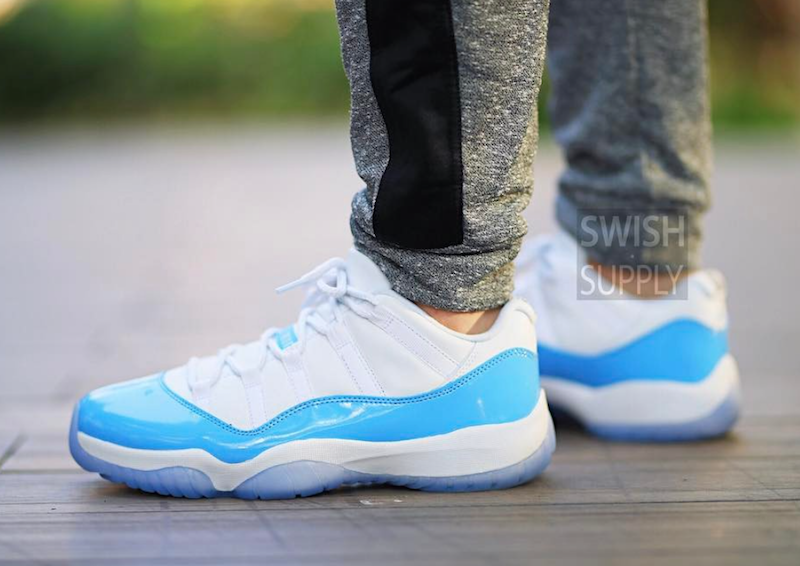 UPDATE: On-feet photos of the “Columbia” Air Jordan 11 Low via Swish.Supply. UPDATE: First look at the 2017 Retro “Columbia Blue” Air Jordan 11 Low.